Every once in a while, you catch a glimpse of an Indie band that has made it through the experimentation and exploration of their tastes and has finally settled on a style that fits them (or has finally decided to do what everyone else is doing…which one is it? You decide.). Barcelona’s new offering “Absolutes” is on a Decemberist’s-Picaresque breakthrough. I’ve been following them a little, off and on, but this latest album marries Indie-ness (intelligent lyrics, nice use of flowing piano and guitar, experimental beats and rhythms) with a set of contagious harmonies that are sure to have radio stations drooling. With a Keane meets Snow Patrol formula, they’ve got some truly singable songs. Colors, bound to be the first radio single, is fantastic, as is First Floor People. 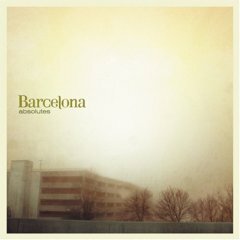 So, be listening for Barcelona on a radio station near you soon…remember, you read it here first. Oh, and here’s a free download of one of their songs. The band also has a “secret download” site if you give them your email.